Esther "Bobbie" Heine Miller was South Africa's first international tennis star. She was so good that for much of the late 1920s and 1930s she was considered a threat to win a major. Bobbie was born on 4 December 1909 in Winterton, in the province of Natal, South Africa. (Note that other sources list alternate dates of birth). As of 2010 she is still going strong, having migrated to Australia in 1978. Circumstances limited her play to South Africa for most of her playing days. One suspects that the distance and money involved hindered her playing annually in the international events. Her first success came at the Natal Chmps in 1925. That same year she represented South Africa when a British team visited during 1926-27. 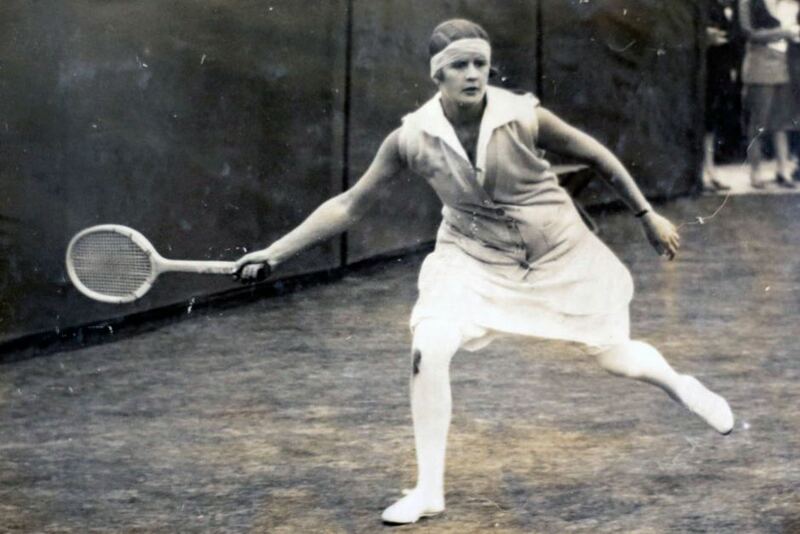 As Miss Heine she first campaigned in Europe in 1927, making the semis of the French and actually winning the ladies doubles with Irene Peacock. The French chmps cemented her reputation when Bobbie upset top seed Lili Alvarez in the quarterfinals by the score of 3-6 7-5 7-5. Heine lost a close semi encounter with the Dutch Kea Bouman, the score being 5-7 6-4 6-3. This was the closest Bobbie came to winning a major. Her performance in Paris lead to Heine being seeded #7 at Wimbledon, the first year seeding was introduced after the Lenglen debackle of the previous year. Bobbie was upset by Phoebe Watson in the 3rd round by 4-6 6-3 7-5, reversing the 6-2 6-4 match in Paris. Heine and Peacock made the fimnals of the ladies doubles, and she also reached the semis in the mixed. Two year later she returned to Europe as part of a sponsored South African ladies team. At the French she was seeded #2. In a strange twist she lost to Cilly Aussem, her 1927 victim, in the quarters by 5-7 6-3 6-4. Bobbie and doubles partner Alida Neave fell in the doubles final. Going across the channel Bobbie found herself seeded #6 at Wimbledon. Bobbie had to contend with Helen Wills in the quarters. Though she fell by the score of 6-2 6-4 she earned respect for her performancepit was the most games anyone got off of Wills the entire tournament. Once again she reached reached the mixed semis. Her titles that year included the British Hard Courts and the Irish Chmps, both the singles and doubles. Bobbie wed farmer Harry Miller in 1931, she would not return to Roland Garros and Wimbledon again until 1938. Fate once again put her in the same section of the draw as Helen Wills Moody. In a dramatic fourth round match Wills won 8-6 6-4. 1938 was the end of Heine-Miller's international career as World War Two intervened from 1940 to 45. Nostalgic to return to Wimbledon one last time in 1947, Miller set off by plane.She was en route to Wimbledon when she crashed in Egypt. Last edited by Rollo; Aug 5th, 2016 at 02:13 AM. When you've sat and nattered with and been asked to play tennis for someone as regal as the Prince of Wales, (the one who went on to become Edward VIII before his abdication in 1936), a visit from the self-effacing ACT Minister for Urban Services is not going to unnerve you. Mrs Esther Miller, 92, of Mawson, was very grateful but not at all awed yesterday when Urban Services Minister Bill Wood presented her with an award as the ACT Housing Tenant of the Month for January. The hands that accepted yesterday's award have accepted a treasure trove of trophies down the years because in the 1920s and 1930s Mrs Miller, for some of that time Miss Esther "Bobbie" Heine, was one of the world's best tennis players. She was the singles, doubles and mixed doubles champion of South Africa many times (she migrated to Australia 24 years ago) and a French Open doubles champion and she played at Wimbledon several times. At Wimbledon in 1927, just 17, she and her partner were losing finalists in the women's doubles. "I got a voucher for 10, and a medal. That was my prize!" Mrs Miller laughed yesterday, marvelling at the millions given in prize money today. Then in 1929 and in England for that summer's Wimbledon she did far, far better than the wistful girl in the famous hit song of the time who sings "I danced with a man who danced with a girl who danced with the Prince of Wales" and who goes on to report third hand what banalities the remote HRH had to say. Mrs Miller, then "Bobbie" Heine, met the Prince and sat and socialised with him, finding she had to explain lawn tennis to him. "Every year," Mrs Miller explained yesterday, "Lady Wavertree, who was a great London socialite, gave charity matches for some charity or other and I got an invitation to play at her courts for her charity. Oh there were film stars and royalty galore!" There is certainly royalty galore in the photograph taken at the occasion. As well as the Prince of Wales there is, seated on Mrs Miller's immediate left and in a helmet-like hat, the Queen of Romania. Mrs Miller remembers that she didn't find the heir to the British throne, later to leave the throne to marry Mrs Simpson, especially awe-inspiring. "I remember him as not knowing anything at all about tennis. I even had to explain to him what a 'net cord' is [it's when a served ball hits the net cord but still falls in and so has to be served again] and that was amusing to me," Mrs Miller chortled yesterday. "But then he actually asked me to play for his own charity two weeks afterwards, for the Prince of Wales hospital, and I did." Mrs Miller won her tenant of the month award in part for what the minister called yesterday her "meticulous" garden and in part for being so helpful with the gardens of other retirees in her complex. The good genes and the habits of fitness that made her such an athlete when she was younger now enable her to go on gardening. As well as all the matches she won, there was the great occasion on the centre court at Wimbledon in 1929 ("My best match I've ever played", she reminisced yesterday) when she played the greatest female tennis player of all time, Helen Wills, and led 4-1 and 30-15 in the first set. But Helen Wills (later Helen Wills Moody) was winning every match she played in those days and wriggled back into the match to win it 8-6, 6-4 and to go on to win one of her eight Wimbledon singles titles. Mrs Miller, who was en route to Wimbledon for a comeback in 1947 when her plane crashed in Egypt, has two children, six grandchildren and 10 great grandchildren. Her name is Esther ''Bobbie'' Heine Miller. She was born in South Africa but has lived in Canberra for the past 50 years … and she is 100 years old today. Back in the late 1920s, and then into the 1930s, she was a French Open doubles champion, a Wimbledon finalist in doubles and a semi-finalist in Wimbledon singles, who rose to be ranked seventh in the world. Wishing to play one last time at Wimbledon after World War II, she took a plane that subsequently crashed in North Africa. Though unhurt, she lost all her possessions in the fire, including her beloved Springbok blazer. All of her requests to have the blazer replaced fell on deaf ears. Until today. Now, no one say anything - no calls to her please, so it can remain a surprise - but today, during her birthday celebrations, surrounded by family and friends, a replacement blazer courtesy of the South African Tennis Association will be presented to her. Bravo; happy birthday to you, and so say all of us, and so say all of us. A really fantastic article on her turning 100-including her son's email address for those who wish to to send theie regards. Last edited by Rollo; Jul 13th, 2010 at 10:37 PM. A National Portrait Gallery (G Britain) photo taken in 1927-Bobbie's first year on the international tennis scene. She won the doubles (with Irene Peacock) at Roland Garros and narrowly lost a 3 set semi to eventual champ Kea Bouman. Last edited by Rollo; Jul 13th, 2010 at 10:39 PM. Last edited by Rollo; Aug 2nd, 2016 at 11:15 PM. "she is a natural player, with a beautiful style, but she gets no practice at all, as since her mariage she has buried herself on a farm, and spends all her time playing golf with her husband. I think-and I have heard many agree with me, that with practice she would be the only women today who could be classed with Suzanne or Helen. But here again, we shall nver know if I am right or wrong, as she is lost to the major tournaments of the world"
Last edited by Rollo; Aug 3rd, 2016 at 05:39 AM. Great articles and pics. Thanks! Irene Peacock is another player who I'd like to know more about. Her nationality is sometimes listed as Indian and at other times as South African. I'm sure she was not of Indian ancestry - this was still in the days of the Raj - but I've always been curious about her connection to India. Did she grow up there? Married there? Later moved to South Africa? Funny. I just mentioned Irene Peacock in another thread. As far as I know she was an English woman who lived in India before moving to South Africa. At the time there were lots of Englishmen who took positions (particularly in government) around the Empire. Some of these lived and worked in a number of countries within the Empire and took their wives or families with them. One of the first champions in Australia, Miss EM Mayne, later moved to India before going back to England (and entering but not competing in Wimbledon). I've always thought this was because her father had taken up a position in India, but no proof as yet. The 1937 Czechoslovakian rankings listed "Frau Hein Miller " as #1. The 1939 German rankings lists Frau A.H. Mueller-Hein. I've always wondered if this was a striking coincidence or if Mr. Miller was Mr. Mueller from the Sudetenland. Does anyone know? Hopefully someone will be able to answer that David. I have added some more meat to the intro post. Thanks! She could have married in India too - there were many single British women who went to India, ostensibly to work as governesses or teachers, but really to try to find husbands. I think they were known as the "fishing fleet"
LOL at "fishing fleet". Wikipedia lists Peacock's DOB as 27 July 1892. she was quite a goodplayer herself, making the final of the 1927 French. EArlier in the 1920s she was Wimbledon doubles finalist with Geraldine Beamish. Seems she is still going strong. Found this little interview (with audio!) from March last year when she was 103 years of age. She should team up with Gardnar Mulloy, although I'm not sure there are all that many 200+ mixed doubles tournaments around for them to participate in.